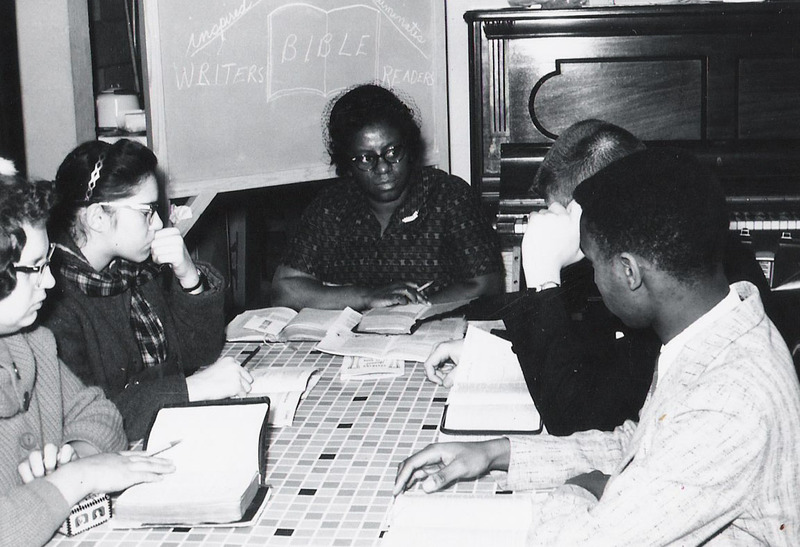 Mrs. Eunice Misner teaches senior high Sunday school at the Valley Chapel Brethren in Christ Church (East Canton, Ohio). Courtesy of the Brethren in Christ Historical Library and Archives. August 29, 1875. The superintendent not being present and a general decline of spirits for want of cool air, the society adjourned by singing a few songs. June 24, 1875 . . . [I]n order to establish a Sabbath School we must first agree that there dare be no picnic and the superintendency must remain in the hands of some church member. May 15, 1881. The school was large and interesting. Quite a number of spectators present. Males 24, females 28, teachers 8, total 60. At the time, no money was available from the Central Conference Revolving Fund. So the church board put it to the people. . . . The congregation accepted the challenge. Everyone’s heart was in it. Small tin banks were distributed to the Sunday school children, and they were asked to bring coins in their banks on the first Sunday of each month. For the next twelve months the children brought in their banks, and the adults presented tithes and offerings to the Lord for the badly needed Sunday school rooms. . . . Even though the congregation had only about eight wage earners, the Lord had blessed the church with skilled builders, and through the donated labor of these men and the sacrificial giving of all, the building was completed debt-free and was dedicated on March 31, 1963. More information on the Valley Chapel congregation is included in Mary Stoner’s booklet, “Valley Chapel Centennial,” published by the church in 1966 and available in the Brethren in Christ Historical Library and Archives (Grantham, Pa.). Pingback: Photo Friday: Breaking New Ground at the Valley Chapel Church « the search for piety and obedience.